An empty nest, grand parenting, great-grand parenting, enjoying retirement . . . all exciting facets of the second half of life! You’ve experienced much and have so much more to offer! Whether you are looking to make new friends, ready for a new volunteer experience, or want to use your life experience to help others – it’s time to get in, get going and get connected with others in the same stage of life. Connect with friends – old and new – over lunch and enjoy great food and refreshing conversation. After lunch plan to stay and enjoy as guest speakers share their passion and insight on a variety of topics including parenting and grand-parenting from the back seat, retirement planning, travel, missions, health & wellness, the bible and much more. Join us the first Thursday of the month at 12 noon – October to May. If you would like to attend the next 65+ lunch, please email 65plus@cdac.ca or call the church at 306-373-5445 to register. There’s nothing better than getting dressed up and enjoying a dinner out with friends. Add a little entertainment and a delicious dessert and you’ve got the makings of a great evening! 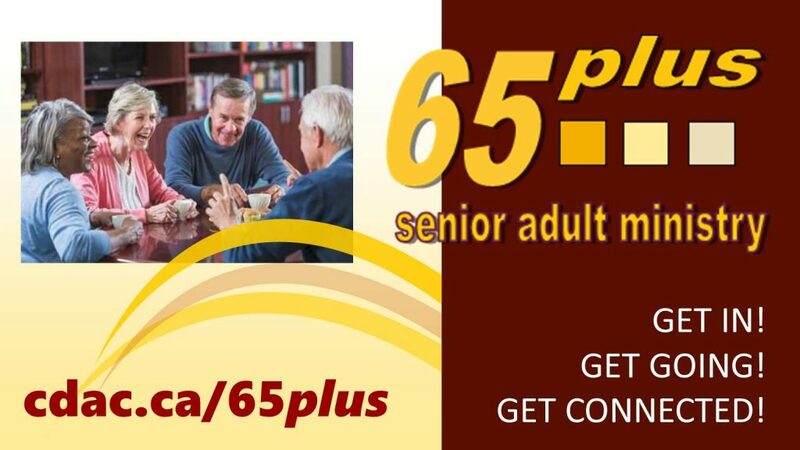 Check the website or Sunday program for upcoming 65plus Connection Events. Becoming and staying physically active as we age is a great goal! Be part of a physical activity program designed specifically for senior adults and meet some new friends along the way at Forever in motion! For more info or to register visit Circle’s Forever in motion page. Volunteering is a great way to connect with friends and build relationships for good while investing in the lives of others. Whether you’re serving young moms at Mom’s Circle, using your handy-man skills on the facility team, serving lunch at a funeral, or leading an Alpha table – there’s a place for you! Join a volunteer team today – you’ll impact lives for today and for the future. Weekly, people at Circle ages 3 to 93, meet together in Circle Groups. Circle Groups meet in homes around the city and some meet right here at the church. Groups unpack the weekly Sunday morning message together, to discover how to apply the teaching in our own lives. Great discussions along with fun and refreshments make for a wonderful time of sharing with friends. Join us as we do life together with friends in the same age or stage of life! For more info on any of our 65plus activities or how you can get involved stop by the Information Desk in the lobby or email 65plus@cdac.ca.